In this WD My Passport Ultra Review, all the things about this drive are discussed honestly. Western Digital My Passport Ultra Portable Drive is one of the popular external hard drives among the consumers who know the importance of data, and it’s backup. Not the Number One but still WD My Passport Ultra is a high-profile name in hard drives list and one of the smart portable model of its family. It is on the list of best sellers due to the versatility, affordable price, performing excellently in the areas of security and backup software, and in numerous help and support channels. You can use WD My Passport Ultra for MAC and PC both, but there are a certain set of actions you need to take to work with MAC because by default it comes prepared to work with Windows use. Don’t worry in this guide you will easily learn how to setup for MAC just follow the guide process is given in below paragraphs. WD My Passport is available in different colors including the black, white, blue and berry with an option for more than 20 mix-and-match colors available in WD Grip Packs. WD can easily fit in your pocket due to it’s compact size. Also, Backup Software is very easy to use, and the encryption of drive is totally lossless and has no effect on the performance of the drive. The speed gives almost equal to Seagate backup plus. WD My Passport Ultra is the successor of the WD My Passport Edge and way faster than WD Edge. 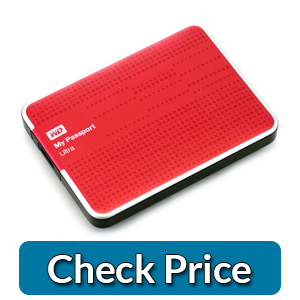 The WD Ultra offers a generous amount of storage capacity of more than 4TB Previously we had wd my passport ultra 2tb and wd my passport ultra 1tb which are still available in the market. SmartWare backup software is included with the drive. The design of the drive is very attractive, and when combined with selected colors it looks beautiful while holding in your hand. Didn’t Agreed with me? Try yourself. In simple words, the WD Ultra is a little wonder in the world of external hard drives that is compact and offers a generous amount of storage capacity to carry your data or backup, and while ready to go with you on travel and giving an excellent performance the new. The editor of wd my passport ultra review recommends My Passport Ultra is an excellent buy. You will be misconceived if you see the WP My Passport Ultra because it looks similar to My Passport Edge. The only difference that can be pointed out is the word “Edge” is replaced with “Ultra” on the casing. Either way the drive is very much similar to it’s predecessor. Being light weight and compact the drive feels sturdy a little bit. As i stated above that the drive comes prepared to work with windows directly as the drive is preformatted NTFS for Windows. In Case you are MAC user and want to use the Ultra for you MAC then it’s a simple process to reformat the drive for your MACs(HFS+). The backup software called WD SmartWare is also included in the drive to take the necessary backups as WD Drive Utilities and WD Security. The Drive also comes with 3 years limited warranty so in case you got an issue with the drive you replace it from the vendors. You can upgrade to the WD SmartWare Pro version at free of cost. This piece of software works with all external hard drives, also the drives offered by other vendors. If you are Ultra user, you can activate the WD SmartWare at two times on two different computers. This brief wd my passport ultra review is best to select a drive for you. WD SmartWare is not required to install for the drive to work. But it is useful. The WD Drive Utilities contains the utilities that are responsible for the drive status, drive functionality and to reformat it. Your contents in the drive can be secured or password protected with the WD security. Don’t ever forget your password otherwise you will loose all your data on the drive. The drive supports very strong encryption and the password selected once is always the key to access your data on the drive. MAC users also pay close attention because both of these WD Drive Utilities and WD Security are available for them as well as Windows users. But WD SmartWare is not available for MAC users it is only available for the Windows users. Nothing to worry for the MAC users as there is always a solution for a problem. Then can install Time Machine with to take the Backup of their data. Though WD SmartWare performs the very handy job for this task but with Time Machine that’s not a big deal. This software is very smart it automatically takes the backup of your important data to incase you are not a computer geek. The best thing about WD SmartWare is that now you can take backups to Dropbox Online service just you need a dropbox account. Then leave it on the software. The downside is that it doesn’t back up the entire system for system recovery in case hard fails. While using the 4TB version with USB 3.0 the Ultra performed 130MPs for writing that is close to the double of My Passport Edge, and it gave 118MBps speed for reading which is also the double of WD Edge. So this is the fasted score for any USB 3.0 external hard drive i have tested so far.I hope that in this brief wd my passport ultra review we explained well abou this little wonder now it’s your turn to take action.After getting your hard drive the very first thing to get the drive in use is to make partitions of it and see this guide how to make partitions for more information. WD My Passport Ultra is one of the fantastic drives in the market while seeing the good facts like speed, efficiency, flexibility, affordability,portability,security, it’s an excellent recommendation for you to buy.